Why are these chocolates good for you? Well, they are made from cacao butter and coconut oil and only sweetened with honey. Coconut oil has a huge range of uses and benefits to our bodies. Virgin coconut oil has the ability to help control weight, improve cardiovascular health, help both our metabolism, bowel and digestive systems work optimally and also helps us to better absorb vitamins and minerals. Click here for more info. So eat up and enjoy! Mix in honey and cashew butter. 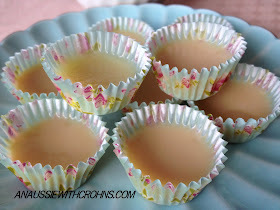 Pour into chocolate molds or mini muffin papers. After unmolding chocolates, store in the fridge or freezer. Put nuts or shredded coconut into the bottom of molds before filling with mixture. You can leave the cashew butter out of this recipe, but I like the creamy nuttiness it adds.